John Wick, later known as John Wick: Chapter 1, is a 2014 American neo-noir gun fu action thriller film directed by Chad Stahelski and David Leitch from a screenplay by Derek Kolstad. It stars Keanu Reeves, Michael Nyqvist, Alfie Allen, Adrianne Palicki, Bridget Moynahan, Dean Winters, Ian McShane, John Leguizamo and Willem Dafoe. The first installment in the John Wick film series, the story focuses on John Wick (Reeves), a retired hitman seeking vengeance for the theft of his vintage car and the killing of his puppy, which serves as a memento of his recently deceased wife (Moynahan). Stahelski and Leitch directed the film together, though only Stahelski was credited. 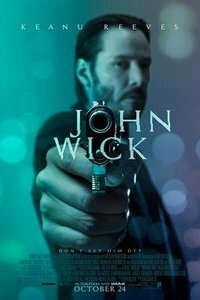 This webpage uses material from the Wikipedia article "John_Wick_%28film%29" and is licensed under the GNU Free Documentation License. Reality TV World is not responsible for any errors or omissions the Wikipedia article may contain.